This October, we’re celebrating back-to-school season by adding a new webinar to the ABMP Education Center every week throughout the month! 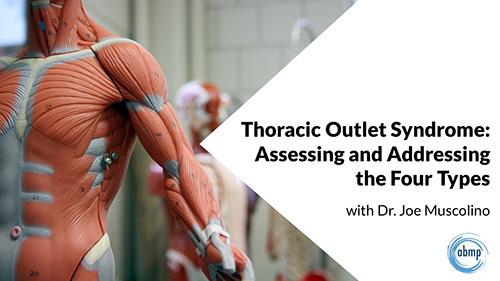 This week’s new webinar is "Thoracic Outlet Syndrome: Assessing and Addressing the Four Types" with Dr. Joe Muscolino. Join Dr. Joe Muscolino for a comprehensive course on thoracic outlet syndrome (TOS). Learn to distinguish between the four types of TOS—anterior scalene syndrome, costoclavicular syndrome, pectoralis minor syndrome, and cervical rib thoracic outlet syndrome—through an in-depth look at the signs, symptoms, and causes of each type. Enhance your ability to assess and treat clients with TOS through orthopedic assessments, palpation, massage techniques, and stretching. Check your email inbox every Tuesday in October to learn about that week’s new course or visit the ABMP Education Center anytime at www.abmp.com/ce. ABMP members have the option to earn free CE hours for each of the 190+ courses in the library. Not an ABMP member yet? Join at ABMP.com so that you can learn and earn free CE with ABMP!